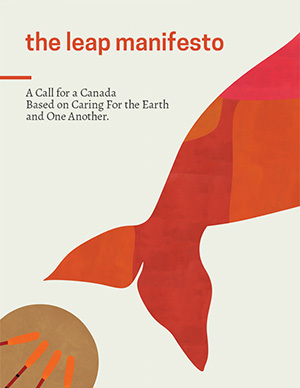 At our 2016 Convention in Edmonton the delegates voted to encourage riding associations to debate the merits of the Leap Manifesto over the next two years in preparation for the 2018 Policy Convention. Shifting swiftly away from fossil fuels so that Canada gets 100 per cent of its electricity from renewable resources within 20 years and is entirely weaned off fossil fuels by 2050. No new infrastructure projects aimed at increasing extraction of non-renewable resources, including pipelines. Vigorous debate on the idea of introducing a universal guaranteed minimum income. Paying for it all by ending fossil fuel subsidies, imposing financial transaction taxes, increasing resource royalties, hiking taxes on corporations and the wealthy, introducing a progressive carbon tax, and cutting military spending.